Your customer has chosen your fine restaurant for their dining experience. It's your chance to impress them with your good taste and flair for a seamless presentation. Let us assist you in the development of your menus, wine lists and guest check covers. We will work with you to design covers that will enhance the dining experience and add to your ambiance. If you desire the highest quality with durability and rich look, these covers are your best choice to present your establishment as a cut above. Customized to suit your needs., these covers are available in many different configurations. vinyl's are stain resistant, water repellant and easily cleaned. your printed sheet and create your custom product. Our diner series cafe covers give that easy laid back style that is reminiscent of your favorite diner. These covers use high polished clear plastic windows with an amazing variety of sewn edge ribbing for just the right look. 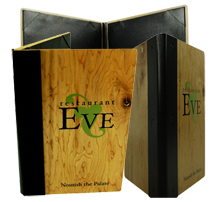 Durable and easy to change, they will keep your menu sheets in great shape day after day. The Diner Series cleans easily and is compact. Brass corners and strong sewing say these covers will be around for a while. When the dining experience has come to an end say, "Thank You For Coming" by presenting the check in style. Guest check holders can be manufactured using the same materials and styles as your menus. Show your guests that you want them to have the best visit possible. Our custom Hotel Guest Directory Binders & Covers give your visitor a professional looking picture of your total services.